What Day Of The Week Is November 15? 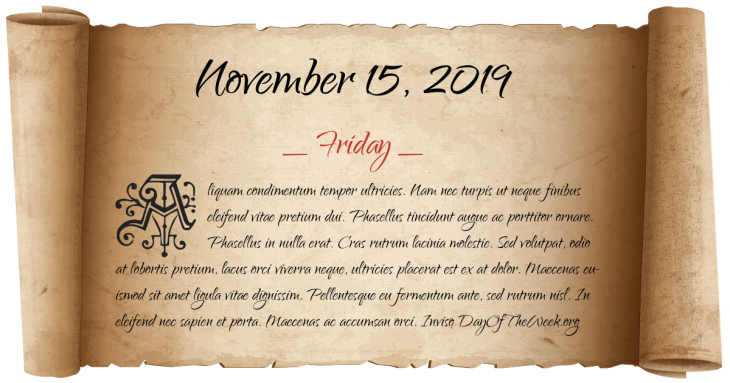 November 15, 2019 is the 319th day of the year 2019 in the Gregorian calendar. There are 46 days remaining until the end of the year. The day of the week is Friday. American Civil War: Union General William Tecumseh Sherman burns Atlanta, Georgia and starts Sherman’s March to the Sea. First assembly of the League of Nations is held in Geneva. The RNLI Lifeboat Mary Stanford capsized in Rye Harbour with the loss of the entire 17 man crew. Four members of the Herbert Clutter Family are murdered at their farm outside Holcomb, Kansas. René Lévesque and the Parti Québécois take power to become the first Quebec government of the 20th century clearly in favour of independence. Turkish Republic of Northern Cyprus is founded. Recognised only by Turkey. Who were born on November 15?